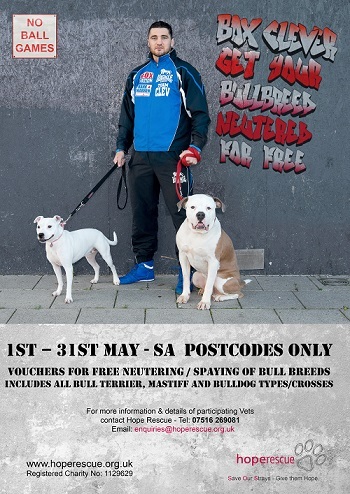 Former WBO light-heavyweight boxing champion Nathan Cleverly has thrown his weight behind Caerphilly based Hope Rescue and their campaign to provide free neutering for Bull Breed dogs in the SA postcode areas. Launched this week, the Hope Rescue campaign is offering free neutering and spaying for any Bull Breed or Bull Breed cross until the end of May. This offer applies to all Bull Terriers, Mastiffs, Bulldogs and crosses, and is open to all households, irrespective of income. Asked why he was happy to take time out of his busy training schedule to help Hope Rescue, dog lover Nathan said: “Neutering your dog is a smart move and will not only prevent unwanted puppies but will also help to keep your dog healthy. Hope Rescue often finds itself at the forefront of dealing with the result of Bull Breeds being bred irresponsibly. Bull Breeds account for a high proportion of dogs finding themselves in rescue shelters and stray dog pounds every year, or sadly being destroyed due to the lack of a home. They are often the most difficult to rehome because of the ‘bad press’ they receive as a result of irresponsible owners. Vanessa Waddon of Hope Rescue explains the reasons behind this campaign: “Our experience shows that there are increasing numbers of Bull Breeds ending up abandoned and unwanted in South Wales. We felt that we had to do something to help reduce the numbers of unwanted dogs and puppies. One recent case bears out this view. A young English Bull Terrier found herself in the pound heavily pregnant and in need of a rescue space. She was taken in by Hope Rescue and after a difficult labour, successfully delivered 8 healthy puppies by caesarean section. These puppies are some of the lucky ones and have been rehomed by Hope Rescue to loving families. But for many unwanted Bull Breed pups the story does not have such a happy outcome. Of the dogs that Hope Rescue saves, the Bull Breeds are less likely to get rescue or foster spaces compared with other breeds, and so on average will stay in temporary boarding kennels for a lot longer. This is not good for their wellbeing as many of them struggle in the kennel environment. Anyone interested in getting their Bull Breed neutered or spayed, can contact Hope Rescue on a dedicated phone number – 07516 269081 or email enquiries@hoperescue.org.uk for more details.